Her new show at the Dallas Contemporary gives language for women's lives and takes it away. ‘Mortal’ is on view at the Dallas Contemporary through December 17th. When KiKi Smith began creating art in the 1980s, she was strongly associated with a group of artists, mostly female, who made a certain type of art Julia Kristeva would later characterize as abject art. Smith’s work focused on the aspects of human life we tend to keep hidden. Tale, a beeswax sculpture of a woman with a trail of feces extending from her rear, is one of the most well-known examples. Women fared much worse in Smith’s early work. Images of violence, often with religious overtones, were common. Engaging with things unspoken is powerful, especially for female artists fighting what seems like a forever losing battle with male-dominated institutions of the art world. Here was art you might not like but couldn’t ignore, and few artists incorporated the abject and occasionally violent in as affecting a way as Smith, whose work was aggressively corporeal. The nature of her work has changed a great deal since then, occasionally to the chagrin of critics confused by her unapologetic sincerity. That’s still somewhat strange currency in today’s art world, and Mortal, which just opened at the Dallas Contemporary, is a survey of works Smith made in the years since the turn of the century, years in which she has continually returned to the subjects of birth, nature, love, and mortality. The centerpiece of Mortal is Pilgrim, a massive installation made of 30 mouth-blown stained-glass panels which illustrate the story of a woman’s life. Inspired by an 18th-century needlepoint by Prudence Punderson, the work shows women sitting and standing, teaching and consoling, giving birth and passing on, giving equal weight to the everyday and the life-altering. Pilgrim is a 21st century version of the Journey, the archetypal stories found in both religious and secular literature depicting (mostly) men as they pass through the various stages of life. Smith’s pilgrims are contemporary women, dressed in jeans and t-shirts, giving birth, raising children, facing death. They confront the viewer with blank stares, seeming to float in their frame and that, in tandem with the rudimentary nature of their illustration, is a bit disconcerting; the glass panels and frames are a surprising contrast with the figure’s starkness and simplicity. It’s a striking work. Overwhelming, even. The panels are situated to serve as a kind of maze. You can’t see the end until you arrive there. The random nature of the panels’ placement, the difficulty one has in discerning a linear narrative to the ‘story’: both work to make the experience of the work itself a kind of journey. Visitors can also experience the work in either direction, birth and death greeting them at both entry points. Pilgrim is meant to be experienced, so I’ll stop. But do note how every aspect of the construction of the work’s experience, the anonymous yet familiar women, the lack of linearity, the blankness of their figures and faces, the work involved in traveling through it, everything about the work compresses our experience of time while masterfully ensuring we have every chance to live these lives as our own. It’s a postmodern journey complete with a sense of confusion and troubling of identity, but one that relentlessly attests to the fact that some things never change, despite how far we think we’ve come. The Dallas Contemporary’s somewhat unique ability to host a work of Pilgrim’s size influenced strongly the curatorial direction of the survey and the rest of the works on view in the gallery also speak poignantly of mortality and our experience of the world. 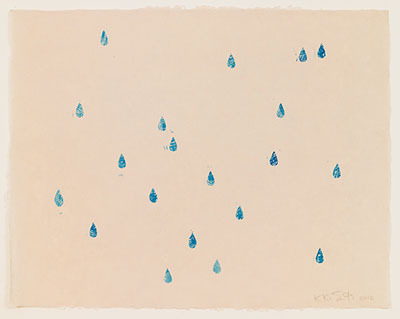 Kiki Smith’s ‘Blue Rain II,’ 2016. Seldom do I find contemporary art as accessible as Smith’s. Perhaps it’s the universality of her interests, but I think our ability to know her work more wholly than that of many of her contemporaries may be owed more to her choice of material and the ways in which she shapes it. Her work is often abstract or simple in terms of visual content. It resonates with its audience far beyond the occasionally modest subject matter. The Blue Rain drawings and Touch, a series of six etchings, both take nature as their visual subject. The images depict delicate rain drops and flora respectively. They’re lovely and evocative, but when placed adjacent to a rather dark and more complex bronze and wood sculpture evocative of earth and decay called Ditch, those first two find more weight in a divine connection with nature: on Ditch there’s biblical text that reads I am the Alpha and the Omega and I will give to the thirsty from the fountain of life. Mortal, the exhibition’s namesake, is a series of 12 woodblock prints depicting a figure at various stages of death. They add overt sorrow but also love to the room’s exploration of the universal aspects of humanity. All these works are knowable, an aspect of art-making under-valued in contemporary art. But while they’re essentially comprehensible thanks to shared cultural signs for the themes of Smith’s work, they’re more than the concrete beings and objects they illustrate. Few artists have the ability to so masterfully manipulate their material into more than an object upon which the viewer projects her gaze. Smith imbues her material with presence and the ability to speak. By the time one traverses Pilgrim to be greeted by Annunciation, a cast aluminum sculpture of an androgynous human figure seated and raising a hand, I would have thought it was a sign of greeting had I not known the work’s title. It may just be I was ready for a break, ready to take on something smaller, more everyday. Pilgrim’s heft both in terms of scale and emotion seems to have a way of doing that to you. But that’s not all. The simplicity of the subject matter in the back room belies its seriousness? No, not exactly. What Pilgrim does is prepare its audience to reconsider the everyday with all the seriousness it actually merits. Works like Annunciation and Ditch are there to help us, to complicate the simple, but I think we were prepared to do the work anyway. It still sometimes seems odd to me, this turn toward sincerity by a woman who made her name challenging the definition of what is and isn’t acceptable subject matter for art, a woman who violently asserted a woman’s right just to be. It would be too easy to ascribe the transition in Smith’s work and interest in terms of her growing older. The work is too complex, the ambivalent relation between religion and life too apparent, the emotional weight too evident. It’s more than life experience. Smith’s work reminds us why we try to explain, but also why we can’t.